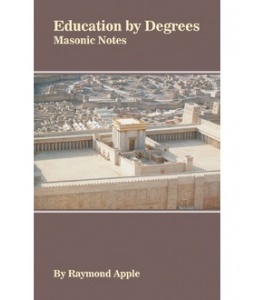 Hot off the presses is Rabbi Apple’s book, “Education by Degrees: Masonic Notes”. The book delves into the history, symbolism and teachings of Freemasonry, enlivened with personal reminiscences and humour. Order the paperback or Kindle edition from Amazon or order the paperback from The Book Depository to receive free shipping. Selections from the book can be previewed on Google Books. This entry is filed under Articles, Book Reviews, Freemasonry.